Cryptocurrency - a digital currency in which encryption techniques are used to regulate the generation of units of currency and verify the transfer of funds, operating independently of a central bank. Trifecta - a bet in which the person betting forecasts the first three finishers in a race in the correct order. It was December 2013 when I jumped into the Bitcoin bandwagon. I signed up with Coinbase and started buying Bitcoins when it was trading at ~$800, right before it crashed to ~$600. It was a bummer. I lost a lot of money. But I knew what I was getting into. It was a risky bet on an early implementation of blockchain technology. I believed in the blockchain and its potential. So I never wavered and held on to my small stash of Bitcoins. I was in it for the long haul. I was a “hodler” before hodl became geekspeak for cryptogeeks. When I started blogging back in 2003 my goal was to share and curate information while learning from my interactions with other people online. That’s been my guiding passion ever since. Since then I’ve tried different social media services from blogging, to photo sharing, to social networks. While my loose social connections online has been generally fruitful, I still gravitate towards curating information on my topics of interests over social interactions online. For a while I’ve used Facebook to gather information and share them with people on my social graph. But I feel that I should focus more on *pulling* information based on my own topics of interests rather than having Facebook’s algorithm push down information down my throat via “news” feed. With the proliferation of FAKE news and mainstream corporate and government PROPAGANDA masquerading as “news”, it’s now more important to be mindful of the information that I digest and share. That’s why I’ve decided to switch to Flipboard to curate information that matters to me. Flipboard makes it easy to bookmark, collect, and share information while making it easy and beautiful to read. It’s like reading a traditional high-quality magazine. I use Flipboard on my iPad and iPhone to inform myself on topics that I deem relevant to my profession, passion, and society as a whole. As of this writing I’ve collected 200+ items categorized across 20+ magazines. If you do a lot reading on the internet, I highly recommend using Flipboard. If you’re interested on the topics that I curate online, check out the magazines I’ve created and follow me on Flipboard. That’s all for now. See you around. Thanks for your attention. I’m not much of a fiction reader. I gravitate towards non-fiction tech and dharma books. I’m now rebuilding my reading list on my blog site. I’ll be adding more as I read and hoard more books. I believe that I suffer from a condition called “Tsundoku“. The problem is that, although I now rarely buy physical books, I’ve been hoarding more ebooks and audio books. Damnit. I just hope that I get to actually use whatever knowledge I’m collecting in this temporal bodymind field. Hello, Everyone! I’m back from my long blog hiatus. During my long break from this blog I did some deep thinking on how to continue with my social media presence. I seriously considered quitting altogether but upon careful reflection I’ve decided to carry on with my online presence. Over the years I’ve connected with interesting people, forged long-time friendships, and evolved my thinking on a lot of things. So at this point in my life I figured that I’m not ready to just walk away from it all. There are intellectual and spiritual interests that I’d still like to pursue which I can’t do offline without interacting with the network of people I’ve already connected with online over the years. So I’m jumping back into the rabbit hole but with some changes to my online activity pattern. First, I’ll get back to long-form writing. I’ve been blogging since 2003. I stopped blogging at the end of 2013 and switched exclusively to Facebook because I didn’t have time to sit down, write, and flesh out my thoughts. But now my focus is to go deeper into topics that interest me. The best way to explore my interests is to do more long-form writing and less on social media interacting. Second, I’ve started a FB page to promote my blog content while maintaining my connections in FB. However, I’ll minimize using my FB account for interaction. My FB interaction will be mostly on my FB page, my blog, and my Twitter stream. So I encourage everyone to comment on my blog or my FB page, share ideas, stop by and say “hi”, or just hit me up on Twitter. Third, I’ll minimize posting about politics and just focus on topics which I find important. I feel that I’ve exhausted my patience and tolerance for politics. And besides, I really hate politics. consciousness, technology, artificial intelligence, machine learning, meditation, psychedelics, integral theory, alternative theories, sustainable energy, and awakening from it all. That’s all for now. Thanks for your attention. Now let’s have some fun! Paul Krugman picked the wrong geeks to mess with. His recent potshots at Bitcoin made him an easy target for Bitcoiners. 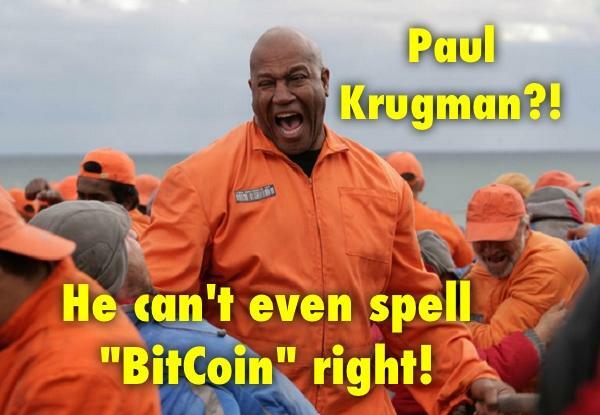 As a rabid Bitcoin evangelist myself, I gleefully participated in Krugman-bashing on Twitter. All in good fun. I don’t take Krugman’s opinion on Bitcoin seriously anyway, especially when he’s just kidding. Gee, nice try, sir! Anyway, I’m not here to insult and make fun of Mr. Krugman. In fact, I think that he is unfairly mocked by Bitcoin fanatics. Yes, he had that coming. But my intention here is to elevate the conversation to another level — a more intellectually honest level of discussion on Bitcoin economics. And it’s not just BitCoin. When I think about the various debates I’ve been engaged in over the past five years, what’s striking is how furious and huffy the other side gets when people like me use picturesque language to get a point across — “confidence fairy”, “zombie idea”, and so on. As in other matters, this is not symmetric. I get called a lot of names, but so what? The argument’s the thing. Underpinning the value of gold is that if all else fails you can use it to make pretty things. Underpinning the value of the dollar is a combination of (a) the fact that you can use them to pay your taxes to the U.S. government, and (b) that the Federal Reserve is a potential dollar sink and has promised to buy them back and extinguish them if their real value starts to sink at (much) more than 2%/year (yes, I know). Placing a ceiling on the value of gold is mining technology, and the prospect that if its price gets out of whack for long on the upside a great deal more of it will be created. Placing a ceiling on the value of the dollar is the Federal Reserve’s role as actual dollar source, and its commitment not to allow deflation to happen. Placing a ceiling on the value of bitcoins is computer technology and the form of the hash function… until the limit of 21 million bitcoins is reached. Placing a floor on the value of bitcoins is… what, exactly? I have had and am continuing to have a dialogue with smart technologists who are very high on BitCoin — but when I try to get them to explain to me why BitCoin is a reliable store of value, they always seem to come back with explanations about how it’s a terrific medium of exchange. Even if I buy this (which I don’t, entirely), it doesn’t solve my problem. And I haven’t been able to get my correspondents to recognize that these are different questions. So, in short, Krugman’s main question is: Why is Bitcoin a reliable store of value? (emphasis mine). I don’t think Krugman is arguing that Bitcoin has no intrinsic value (well, I hope not!). This is actually an excellent topic for economists to hash out and dive deeper into. It seems to me that Krugman is attempting to separate the Bitcoin as a currency aspect from Bitcoin as a protocol/platform. And therein, lies his mistake. Bitcoin by itself has no intrinsic value, let alone a reliable store of value. The value of Bitcoin is co-created by its decentralized protocol and the network of people who believe in its value. An excellent analogy here is that of a telephone and telecommunications infrastructure. By itself a telephone is useless and is only good as a paper weight. But once connected to a telephone network it becomes very valuable.